The Laboratory for Multiscale Mechanics has developed an expertise in the fabrication of 3D- microstructures. Daniel Therriault’s research team aims to design new materials and integrates them into mechanical systems by using new microfabrication and nanofabrication techniques. Despite the advanced progress in recent years in manufacturing of 3D-printers, big challenges remain in making structures in micro/nano scale and in printing different materials with the desired electrical or mechanical properties. LM2 research team use I & J Fisnar and a custom made Micos nano station to make free-form 3D microstructures which is not possible to be made by 3D printers available in the market. These microstructures have been used for different applications such as MEMS, micro-antennas and lab-on-chip. LM2 group is also working on manufacturing new types of conductive materials useful for 3D printing of microstructures applicable in the field of microelectronics and sensors. Static testing frame with 50kN, 1kN, 100 kN and 5kN load cells. Three dispensing robots, two used for 3D-printing of microstructures such as microcoil or scaffold, and one used for spraying thin films with high control on the film thickness. The dispensing robots, extruder, three-roll mixer and spray system are placed in ventilated chambers to prevent the inhalation of toxic materials by the users. A fume hood is used for working with toxic volatile materials. A glove-box is used for handling of carbon nanomaterials, such as carbon nanotubes and graphene with high security. Three-roll mill for mixing of nanofillers in polymers with electronic control of all the mixing parameters (gap and operating speed) which assures reproducibility. Micro-extruder has 5 ml volume capacity and a maximum temperature of 400oC. The twin screw revolution can go up to 400 rpm. Centrifuge with the maximum speed of 2000 rpm for separation of solid and liquid phases in a short time. EXAKT 80E three-roll mill used for dispersing nanofillers in a polymer matrix (i.e., thermosets). Xplore Micro-extruder used for mixing nanofillers in polymers (i.e., thermoplastics). 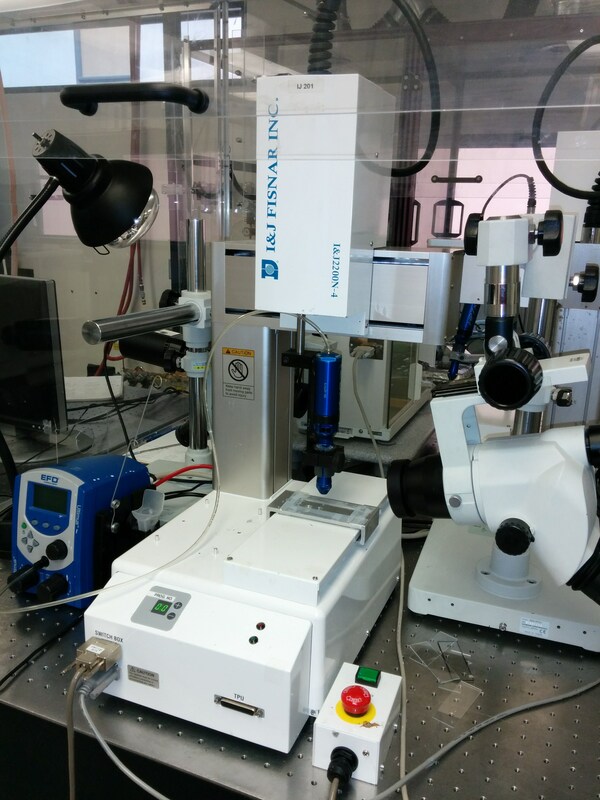 Fisnar dispensing robot used for 3D- printing of microstructures. Olympus BX61 microscope using 7 different lenses with the maximum magnification of 100x. Olympus SZX-12 microscope with two different focus depths. SPEX SamplePrep ball mill mixer used for mixing nanofillers with polymers.